Monday, June 12, 1911: Started to pick strawberries this morning. Of course it will mean some early rising and loss of sleep, but just look at what I can earn. It sounds as if Grandma got paid for picking strawberries. I wonder if she worked for a neighbor who raised the strawberries, hired workers to pick them, and then sold them in town—or if her parents raised berries for sale (and paid their own children to harvest them). Regardless of who owned the berry patch, I bet that the Muffly family enjoyed eating strawberries. I don’t know how Grandma’s family served strawberries, but when I was a child we ate shortcake muffins with strawberries and milk almost daily during June. I would guess that they also ate strawberry shortcake a hundred years ago. We ate strawberry shortcake for supper—and it was part of the main meal (not a dessert). The menu consisted of shortcake, and meat or fried potatoes. 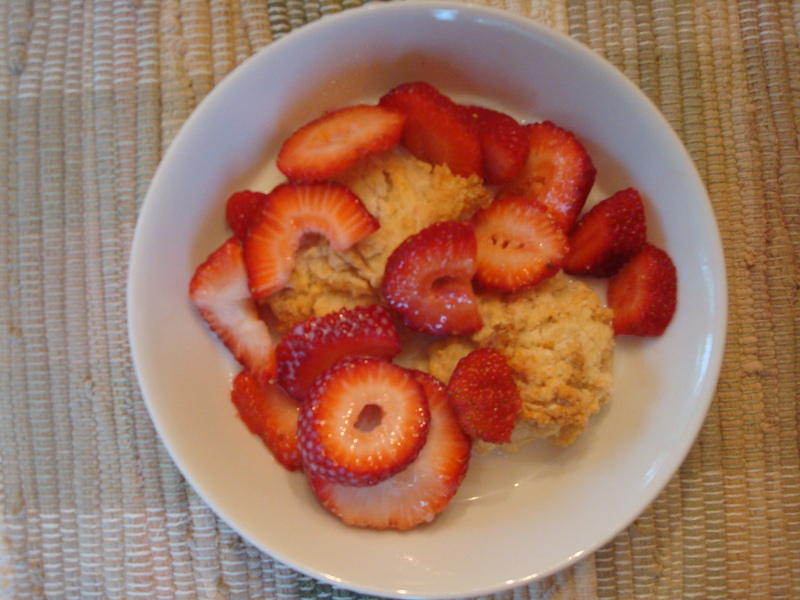 It seems a little strange today—but back then on those hot June days we’d typically have a heavy meal for lunch (we called it dinner) and a relatively light meal with strawberry shortcake in the evening. In June on the farm we’d being baling hay—and there was lots of hard, hot labor required to get the hay baled and then stacked in the barn—so it seems even more amazing to me now that we ate a relatively light meal (that many today would consider a dessert) in the evening. Preheat oven to 420 degrees. Stir the flour, baking powder, and salt together. Cut the butter into the flour mixture . Add milk and stir just enough to combine using a fork. Grease muffin pan and fill each about 3/4 full. Cook about 18-20 minutes or until lightly browned. Serve with strawberries and milk (optional). Posted on June 12, 2011 August 30, 2015 by SherylPosted in Food, recipesTagged dessert, strawberry.